This one-million-second image, known as the "Chandra Deep Field-South" since it is located in the Southern Hemisphere constellation of Fornax, is the deepest X-ray exposure ever achieved. Most of the objects seen in the Chandra Deep Field-South are active galaxies and quasars powered by massive black holes. 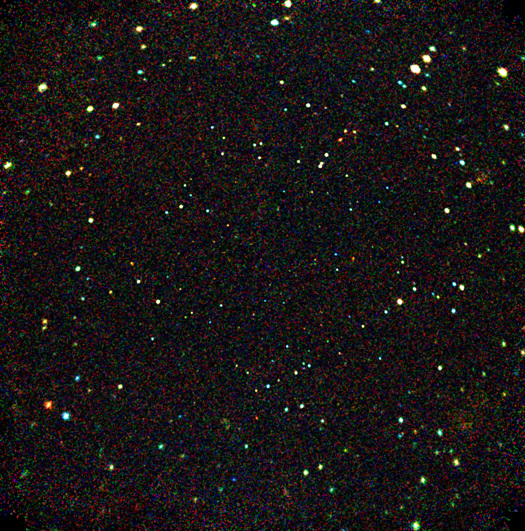 Also in this Chandra Deep Field-South image, for the first time in such deep exposures astronomers detect X-rays from many galaxies, groups, and clusters of galaxies. The intensities of the X-rays in this image are depicted, from lowest to highest energies, by red, yellow, and blue respectively. 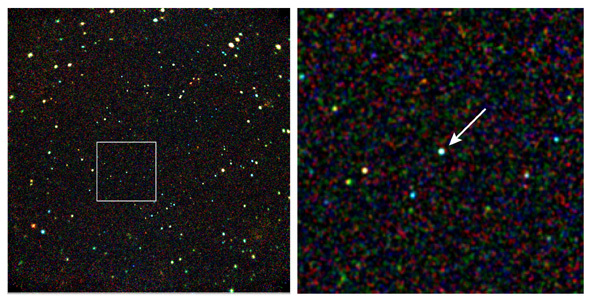 Another early exciting discovery to emerge from the Chandra Deep Field-South is the detection of an extremely distant X-ray quasar shrouded in gas and dust. The discovery of this object, some twelve billion light years away, is key to understanding how dense clouds of gas form galaxies with massive black holes at their centers.